Pt100 sensors demand more conditioning effort than other sensors as the resistance change over temperature is very small. The problem gets worse with distance: the resistance of the cable adds to the signal resistance with the effect of wrong results. 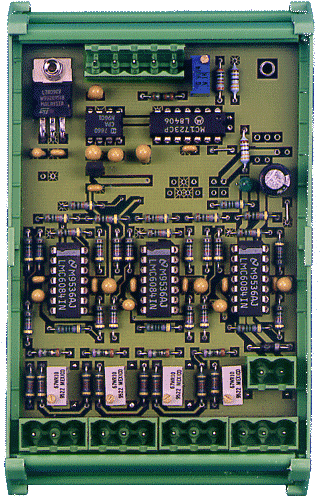 Pt100V4 amplifies the sensor signal and compensates cable effects. Sensor conditioning module for Pt100 RTDs. Four instrumentation amplifier inputs for Pt100 sensors. 3-wire-connection to compensate for cable resistance. Four 0..5V voltage outputs to NET/900H, TSM-CPU, TSM-8AD8, TSM-8AD12 or any other 0..5V analog inputs. Pt100V4 produces a reference current of about 1mA to result in a voltage change over the sensor resistance. This voltage is amplified to give a 5V span over the desired temperature range. A common way to account for long cables is the 3-wire-connection. This allows to measure the voltage over the shorted line resistance in comparison to the voltage over the sensor resistance. Substracting these voltages results in a signal voltage that is independent of cable resistance. Pt100V4 works with 3-wire technology. The typical accuracy at a module temperature of 25°C is ±0,3°C. It requires 18..24V auxiliary voltage. Although Pt100V4 looks like a TSM module, the TSM-CPU cannot directly read the module but requires 4 analog inputs. Pt100V4 has a 5-pin-screw terminal block to connect the conditioned 0..5V outputs to an analog input.